I was surprised to get alerts tonight that I had used up almost all of my monthly data tonight when earlier today I was fine. 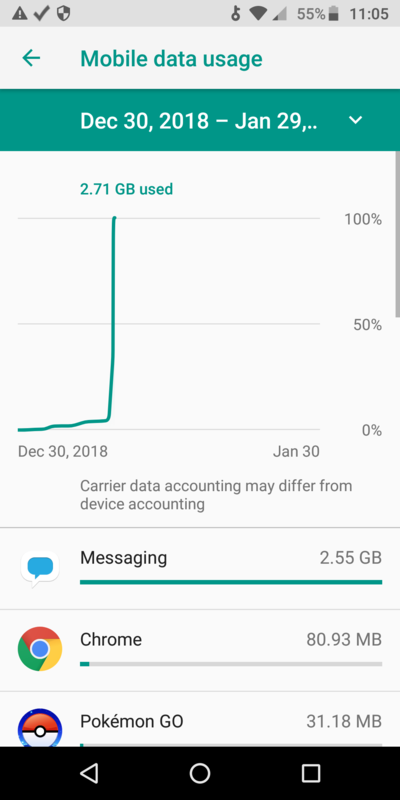 I checked the data usage on my phone and your messaging app has used 2.55 GB of mobile data, most of it tonight. Can something be done about this? It wasn't actual usage on my part. Thanks. I'm in the same boat after switching phones. Replaced my Galaxy S7 (broken screen) with a Meizu 16 import, moving the SIM card over on 12/31 and within a week the messaging app alone had used 8gb of data, including 2gb of mobile plan data draining my account. I rarely use the messaging app at all, no texts or calls, so what is it doing that every minute or so its using 2mb of data? Add to that, I signed up for premium VIP service to try to get support and when I try to create a ticket it says I'm not signed up for VIP service. 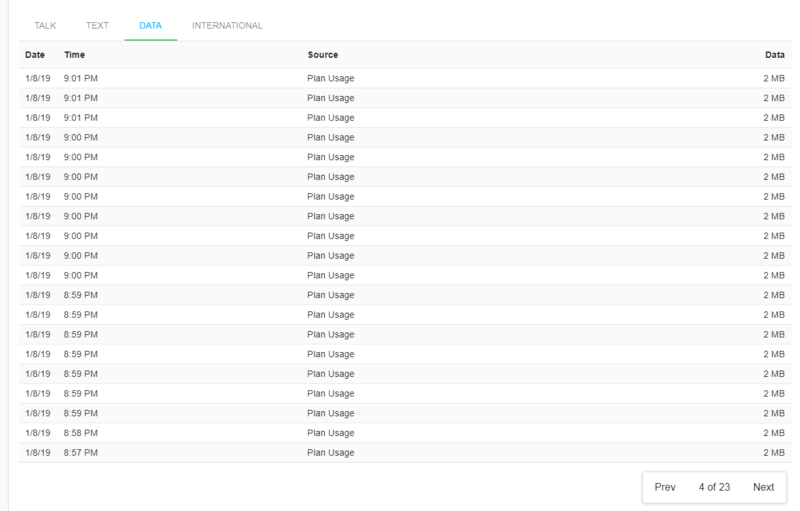 I did see the unusual activity in the log of my data use, too. On 1/8, from 6:53 pm to 9:14 pm, there is a steady stream of 2MB of use when I was on wifi (and at a computer so generally not using my phone) and not making any calls or texting. I'd appreciate it if you could look into this further. Thanks. Please keep in mind also about the three-hour delay in data reports. This means the timestamp on the usage online could be delayed up until three hours because we use major carrier networks but not own them. This means the usage could have taken place up till three hours before but you see it posted until that time. The only time I truly used data that day was before noon and briefly after that string of 2MB but before I got the overage alert and shut down data completely. At no time in the day did I make a phone call or send a text message. It was all the Messaging app when I wasn't calling and texting. Thank you. Is there a way to send that information privately? I'd rather not put my MEID number out on the public forum. Yes, it's under this same email address - the last 4 digits are 5818. Thanks. Yes, it's the account for phone number ending in 5818. I just double-checked, and the other account tied to this email address is an old SIM that isn't even active and I really just need to get removed. All right. Thank you for looking into it for me.